The word mourning is primarily used for the loss of a loved one through death. I have mourned the death of my mother, my grandfather, and my brother. I watched my dad mourn the loss of my mother, and the look of absolute lostness in his eyes was heartbreaking. But as I type this, I think of the people I know who have suffered the loss of a child. It is an unspeakable pain that I have witnessed, but not truly felt. I spent 2 days in the hospital with dear friends of mine as they endured their daughter’s death of a heroin overdose. She was the age of my own daughter, and I cannot tell you the thoughts and emotions that were so raw in me as I walked with my friends through such a grievous time, ending with turning off the respirator. Their fear, turned to desperation, turned to resignation, and then turned to realization, was almost more than my mother’s heart could handle. I am convinced that nothing but the grace and mercy of God can touch that kind of pain. The word comforted in the passage above means “to call to ones’ self, to call near”. The picture I get is of a Father calling His child to come to Him, drawing that child into His arms and giving the comfort of His nearness to counter the loss. I can’t help but wonder if the comfort of a God they cannot see or touch would be enough in the waves of such a devastating loss, if the comfort of anyone or anything would be enough. But my friends would testify that the nearness of God, even though felt only through the presence of His servants, is indeed a great comfort, even in that kind of loss. They would say that while they could not see or touch God during those days in the hospital, they saw and touched those He had sent to be near to them, and they were comforted. In the midst of the losses I have suffered, both of loved ones, and the loss of love, trust and affection in relationship, my initial tendency was to withdraw and be alone with my wounds. But I learned that as I allowed myself to be drawn near to God, through worship, through His Word, and through the love of His Body, I found the comfort I desperately needed. 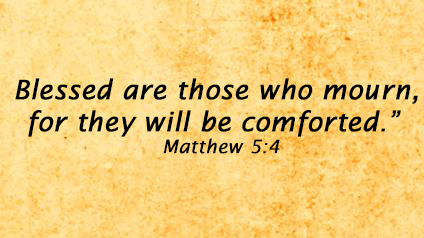 Blessed are those that mourn, for they will be comforted. It is His promise to us. On one hand, I would have preferred the promise that we would never mourn. But on the other hand, we would then never truly know the comfort of the nearness of God. If you are experiencing mourning, I pray that the God of all comfort will call you near to Him, and that His nearness will be a balm for your wounded heart. Thank you for your comment. I do agree with you…transparency with others is important if we are going to allow God to use His servants to comfort us, help us receive His healing, and encourage us in the midst of our pain.